I found 3 of the quickest, somewhat healthy and most of all yummy breakfast ideas suitable for the work week - so I'm sharing! This one is ridiculous in its simplicity. I hated "quaker oats" as a child because my dad made such a fuss about it and it just looked yucky. I have come to love it for many reasons. It's affordable, really easy to make and most of all, healthy. I spruce things up my adding a selection of fruit; my favourite are blueberries and pomegranate for some extra texture. A delicious alternative is also crunchy peanut butter for an extra dose of protein/fat. On days when I feel like a cooler and simpler breakfast, I swap the oats for Greek yoghurt. I tend to stay away from the flavoured ones because of their sugar content (you'd probably scream if you read the label). Plain is the way to go - topped with some honey for sweetness if desired. I LOVE banana bread. For me it's simply an excuse to eat "cake" in the morning. I make my banana bread with different nut toppings each time to keep things exciting. I often make a whole load at the weekend, cut into slices and freeze. Once in a while I’ll bring out a slice the night before, allowing it to thaw in the fridge and I simply pop it in the microwave for a minute the morning after. Enjoy with a smoothie or a cup of your favourite morning drink, tea, coffee, juice. Easy Peasy! You're probably wondering how avocado eggs on toast is "super quick". It actually is! All this entails is slicing up a ripe avocado, slicing up a lightly boiled egg and placing on some buttered toast. Top with salt and pepper if you so desire. All can be done (and eaten) in 20mins. I have found that hard boiled eggs just don't go well with toast, so I try not to over-boil the egg so that the yolk is still a little fluid. 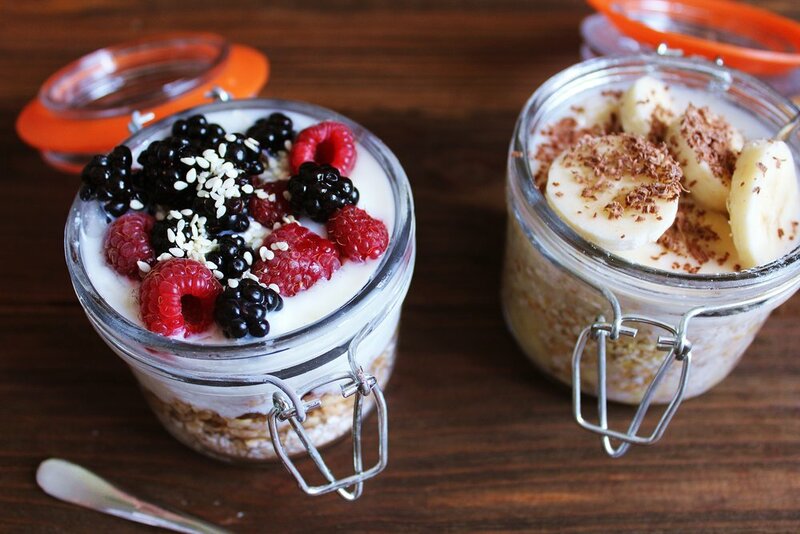 I hope you try these easy breakfast ideas; I would love to hear if you do. When Lola mentioned that she'd love to share these easy breakfast ideas, I jumped at it because it was such a need. If you follow me on Twitter (@kacheetee) you may have seen when I asked what people generally had for breakfast that was quick yet yummy and healthy. While I often packed my lunch for work, breakfast was slightly tough - thanks to time. I'd also been spending so much money on store bought breakfast. And the worst part was that I often succumbed to a McDonalds as it was just right in front of my office building. So not healthy for me and my pocket! Like Lola, I hated oats as a child but I've come to find it works for me with fruit toppings and granola. My favourite is pineapple, and sometimes strawberries. I'd definitely try her topping suggestions. I'm really not a fan of avocado (yes I'm one of those), but looking forward to trying number 3 - who knows I might just love it! What do you guys eat for breakfast generally - when you have to go to work or school? Please share your ideas!